Dennis and Mary Jo Weiss have been married for more than 30 years. 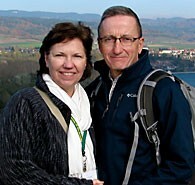 They write about a shared love of nature, prayer, and their children and grandchildren from their home in Hamburg, New York. I was thinking about topics to write about for this month when it occurred to me that I never have shared about our experience of how our son Peter came to be part of our family through the process of adoption. That was many years ago, as Peter is now a young man of twenty-two and on his own making his way in life. I realize that so many couples have gone through the adoption process to start their family and I am sure that each has their own unique story to tell about how that unfolded for them. Our story starts shortly after our youngest daughter Jessica was born. After Jessie entered our family, Mary Jo and I now were the proud parents of four beautiful daughters and so excited, along with being somewhat overwhelmed by caring for four children under seven years old. I remember thinking to myself that our family was complete now. At least to me it seemed that way. What more could we ask for than to have four healthy, beautiful girls bringing joy and laughter into our home? Well, it did not take too long for Mary Jo to want to try again to have another child, as it was still her dream to have a son. I on the other hand was perfectly content with the four daughters God had blessed us with and did not feel the need to keep trying for a boy to enter our family. I will readily admit that I was pretty self-centered at the time and was not very sympathetic to Mary Jo’s desire for a son. I could write pages on this difficult period in our marriage but that is a topic for another time. Let me just say that in looking back on that period through the lens of time I realize that I could have avoided much struggle and discord between us by empathizing with Mary Jo and her motherly instincts and trusting in her, rather than focusing on what I wanted. Needless to say we eventually worked through this struggle by reaching the mutual decision to adopt a little boy. So began a whole new chapter of our marriage. For anyone that has gone through the adoption process, you will know that it is long and involved. There is the home study to be done and many meetings with agency staff. In our case the agency we worked with was out of state. We also decided to pursue a foreign adoption, which led to more complications and delays. Remember that this was the early 1990’s, before email and the instant exchange of information via the internet, so you can just imagine the extra time needed to communicate and process paperwork. At the time we knew a couple down the street who had recently adopted a little girl from Russia, which had just become more open to placing their orphan children with families from other countries. A big factor in this decision also was that Russia allowed for only one parent to travel to finalize the legal process for adoption. This meant that Mary Jo could stay home with the girls while I traveled to Russia for two weeks to complete the adoption. Many counties require that both parents be present and stay an extended time in country before finalizing the adoption of their children. So we focused on finding a little boy under the age of three from Russia. As I write this, I realize that I could never really tell the complete story of how Peter came to be our son in this column. It would take pages to relate all that went on. Also, I do not want to give the impression that the adoption process itself was something to dread. We did have our setbacks as we went through the process, but there was so much joy and anticipation that went along with it. As I reflect back, I really believe that God was in complete control over the entire adoption process. For example, there was the time that we “lost” one little boy when the agency informed us, after we had seen a video and photos of him and were told that he would be our son, that he was no longer free for adoption. The officials of the town where he was from had decided to close off their region to foreign adoptions. It was as simple and blunt as that and there was nothing anyone could do about it. The final challenge was when the agency found a beautiful little blonde haired boy that was just released for adoption in the Moscow area. So we quickly made all the necessary arrangements and just two days before my flight was to depart, we received a phone call from our caseworker that the boy’s mother had changed her mind and would not sign the release papers. Therefore, they no longer had a little boy for us in Russia. Obviously, we were devastated by this last minute news. But, as I said, God was in control and the agency did locate a little boy in an orphanage outside of Smolensk, but had very little information on him other than some basic facts. On a hope and a prayer we decided to keep our plans and that I would fly over to Russia with the hope that all would work out for the best. To make a very long story short, this little boy was in fact the one I believe God meant to be part of our family all along. When I first met him in the orphanage he was very reserved and hesitant, and would not speak a word or even come near me. But after I bribed him with a box of raisins, which he very quickly devoured, his eyes lit up and such a pure innocent smile shown across his face. I knew then and there that no matter what happened from that point on, there would be no turning back from this child. Peter Mathew, which means “Gift from God,” was our son. In our next column, Mary Jo will write about what it was like to welcome Peter into our family. Choose life and you will find love.